John Butcher was born in Brighton but has lived in London since the late 1970s. His work ranges through improvisation, his own compositions, multitracked pieces and explorations with feedback and extreme acoustics. 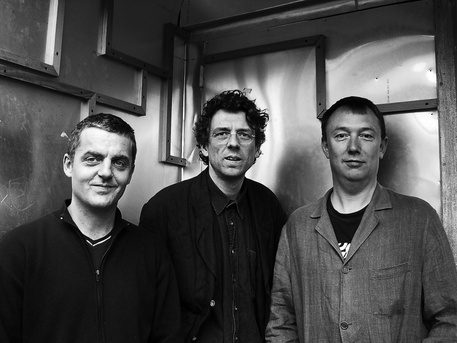 Originally a physicist, Butcher left academia in '82, and has since collaborated with hundreds of musicians: Derek Bailey, John Tilbury, John Stevens, The EX, Akio Suzuki, Gerry Hemingway, Polwechsel, Gino Robair, Rhodri Davies, Okkyung Lee, John Edwards, Toshi Nakamura, Paul Lovens, Eddie Prevost, Mark Sanders, Christian Marclay, Otomo Yoshihide, Phil Minton, and Andy Moor, to name a few. He is well known as a solo performer who attempts to engage with the uniqueness of place. "Resonant Spaces" is a collection of site-specific performances collected during a tour of unusual locations in Scotland and the Orkney Islands. His first solo album, Thirteen Friendly Numbers, includes compositions for multitracked saxophones, whilst later solo CDs focus on live performance, composition, amplification and saxophone-controlled feedback. Recent groupings include The Apophonics with Robair and Edwards, Anemone with Peter Evans, Plume with Tony Buck & Magda Mayas and a trio with Okkyung Lee & Mark Sanders. Butcher values playing in occasional encounters - ranging from large groups such as Butch Morris' London Skyscraper and the EX Orkestra, to duo concerts with David Toop, Kevin Drumm, Claudia Binder, Paal Nilssen-Love, Thomas Lehn, Fred Frith, Keiji Haino, Ute Kangeisser, Matthew Shipp and Yuji Takahashi. Matthew Shipp was born December 7, 1960 in Wilmington, Delaware. He started piano at 5 years old with the regular piano lessons most kids have experienced. He fell in love with jazz at 12 years old. After moving to New York in 1984 he quickly became one of the leading lights in the New York jazz scene. He was a sideman in the David S. Ware Quartet and also for Roscoe Mitchell's Note Factory before making the decision to concentrate on his own music. Mr. Shipp has reached the holy grail of jazz in that he possesses a unique style on his instrument that is all of his own- and he's one of the few in jazz that can say so. Mr. Shipp has recorded a lot of albums with many labels but his 2 most enduring relationships have been with two labels. In the 1990s he recorded a number of chamber jazz CDs with Hatology, a group of CDs that charted a new course for jazz that, to this day, the jazz world has not realized. In the 2000s Mr. Shipp has been curator and director of the label Thirsty Ear's "Blue Series" and has also recorded for them. In this collection of recordings he has generated a whole body of work that is visionary, far reaching and many faceted. Matthew Shipp is truly one of the leading lights of a new generation of jazz giants. This conversation was recorded at Konfrontationen 37 in Nickelsdorf, Austria. Matthew Shipp: John, I’ve always been interested in how a player from the UK actually sees the UK jazz scene. To me, from America, it seems a really dedicated group of people that are very focused and very self-aware. The players I like from the UK really know who they are and they really delve into themselves and develop a language. Sure, it’s jazz, it's this and that, but there’s just nothing pretentious about it — for the majority of the players that I’ve considered. John Butcher: I wonder which players you mean. I’m not sure it’s related to jazz, a lot of it. Matthew Shipp: Yeah, that's what I'm saying. 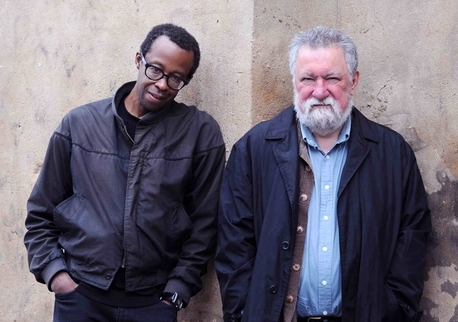 Let's just take names that people really recognise like Evan Parker, Derek Bailey... they obviously know jazz and have a great background, but the music is really its own subset of whatever. 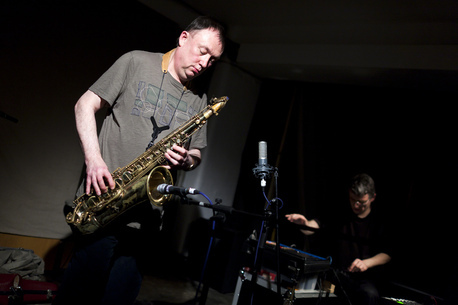 It’s just really interesting to me how all the people that I associate with “UK improvisation” are just very focused and stick with a language of sorts — it kind of works when they play with other UK musicians, you know, the different permutations of people — it’s actually self-contained but open at the same time in a way that we can work together... I'm finding that a fascinating thing and wonder what’s your sense of it — being in the middle of it. John Butcher: It’s complicated, because it’s a music that now has a history of its own, in a way. Back in the 60s, there was a flourishing of what I think as real British jazz - people like John Surman, Mike Westbrook, Mike Osborne — who were trying to make a different kind of jazz from the American jazz. The players from the 50s had mostly taken Bebop as their model, like Stan Tracey, Ronnie Scott, Pete King. That '60s generation were creating in a way their own jazz, and they were quite influenced by the influx of South Africans who came over, like The Brotherhood of Breath. In a way, I see that as one stream, but a lot of the early improvisers were actually trying to break away from jazz, trying to find a way to make music together which didn’t rely on jazz principles. Some more strongly than others. I think somebody like Evan Parker has always thought of himself connected very much with the jazz tradition. Derek Bailey really didn’t — and didn’t want to be seen like that — he would argue that he had nothing to do with it although he played jazz in the 50s. Back then there were quite purist lines being drawn about trying to improvise from 'first principles' — as if you hadn’t heard any other music — as a way of wiping history clean and trying to start again, and, of course, you can only do that for about two days. It’s a very complex thing, that transition is a fascinating period, without a doubt, and in a way there’s as many stories as there are musicians who were doing it, because there wasn’t that many musicians. Obviously, over the years it’s relaxed and people aren’t in so many different camps. I think it’s because we never had a strong jazz history as a country. We relate to it in a different way than, I guess, the music environment you grew up in. What was it actually for you? Matthew Shipp: It was a jazz environment... My mother was friends with Clifford Brown. I was probably more interested in classical music until I was 12, but when I got into jazz it was really heavily, like Ahmad Jamal, Nina Simone, Oscar Peterson and from there I heard Andrew Hill and Cecil Taylor and people like that. I never really cared about genres. I always wanted to develop a language that — I won’t say starting fresh, because I don’t even believe in time, cosmically — but I wanted to find that initial dimensionless point where you could generate music from, that was like a virgin territory. So that was always in the back of my head somehow, even though I grew up in an environment where people emphasised aspects about the history of jazz, and that’s one problem with jazz, it’s so historically rooted and people are always very pedantic about history and about this and that. You know, these instruments were built at one time — somebody picked one up for the first time. It’s really interesting to think about the point of discovery and how fresh it was for someone to improvise on the piano for the very first time, how cool it would be to not have been covered by history. John Butcher: In a way, you do that as a kid, when you come across a piano and just experiment with it. Matthew Shipp: Sonny Rollins was asked how he developed. He said his mom bought him a saxophone and he would just go in the room and play. Anything. Just play. Basically he says it’s still what he does today. In the mean time, he learned the music rudiments and stuff, but he still basically goes in his room and just plays. 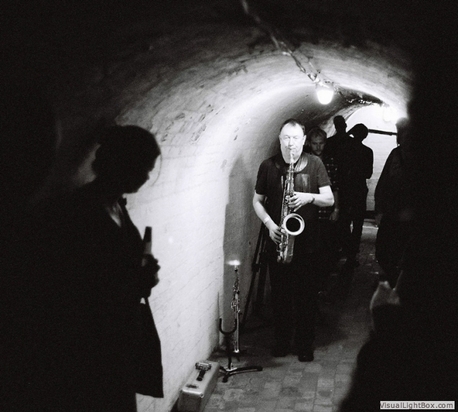 John Butcher: I think perhaps the jazz connection with some of the early improvisers and perhaps to some extent myself, is that idea of finding your own voice, which is a long-term thing, and learning by doing it. You don’t really learn it by theorizing too much, you learn by playing with other people, and that’s sort of independent of style or genre, it’s a kind of mental attitude. Your discoveries are made in the playing situation. When I started out a lot of sounds people found very unacceptable in improvisation, especially mine. (laughter) Now there’s a very wide sonic palate that you can use. I like it when it comes naturally, through a player’s experience, in situations where they haven’t sat at home and studied ways of working with certain sounds or the books that talk about it, but it’s come about from the experience of playing. Wouldn’t you say like jazz in America is kind of being killed by the schools? John Butcher: It’s not jazz any more. Matthew Shipp: I don’t know what it is. I’ll tell you a story that encapsulates that. This is according to a friend of mine who was at a jazz festival (I was not there to verify it) — Herbie Hancock and Wayne Shorter were playing so he went to their sound check thinking it would be cool just to see them. So he walks up to the front and these two musicians are playing, but it’s not Wayne and Herbie (laughter). So they hire people like from Berklee School of Music that can play like them to do their soundchecks. It’s like…wow, man! (laughter). That tells you there’s something wrong, instantly. Since you mentioned early-on — certain sounds were unacceptable — have you ever actually had somebody come up to you after a gig? John Butcher: I’ve had people come up to me like: ‘You shouldn’t be allowed to play like that’ In Germany'. (laughter) I can remember it very clearly; in Cologne, in the nineties, playing somewhere. Somebody came up to me afterwards and got very angry. Bogdan Scoromide: They reproach Hans for the more electronic sounds at this festival, every year. John Butcher: Well, it depends what you mean by that and who’s doing it. Matthew Shipp: Well, I’m not going there but, do you ever play in certain situations and it’s like: ‘here we go again’? So, you know there’s a set group of things you can not do in that setting? John Butcher: I think my temperament is more... if I can hear it go that way, I probably would try and take it another way. You know, if it’s a very austere, minimalist improvising situation, I’m likely to get a bit steamy at points, and do the opposite in a free jazz thing. It’s kind of just not going with ‘the expected’. You don’t want to be just perverse, but the interest for me in improvisation is making that kind of music which you couldn’t really imagine before you find yourself in the middle of it. Matthew Shipp: Right, right. That’s one of the best definitions I’ve ever heard of what artists like ourselves should be trying to do. John Butcher: Because the worst thing is when someone comes with a fixed agenda of what they want to make happen in the piece. I suppose there’s about fifty people around the world I really like playing with, and get the chance to do it over a number years in different combinations. And it’s people who’ve got a strong personal language, but at the same time a great flexibility. Matthew Shipp: Yeah. I feel there’s so few people in the world that I can really relate to their phrasing. First is the sound, then the phrasing. And there’s so few people who I can really relate to the elasticity. Because to me, there’s a very specific kind of thing that is new now, and certain jazz players phrase a certain way and you can tell they can never get past a certain thing, but you can’t just throw people together just because they play jazz or free jazz. I mean, there’s people that are kind of meant to play together. I’m not trying to sound cosmic, it’s just the elements of their personality allow it to happen, and to flow freely and freshly. There’s very few people in the world that I really feel myself, I enjoy playing with. 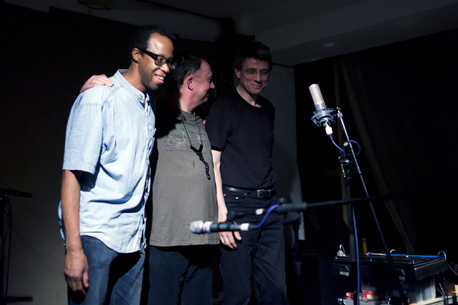 Matthew Shipp: Since we did this trio, I never knew Thomas [Lehn] before you suggested him. What made you think of that as a concept for a group? John Butcher: The group wasn’t really trapped by the history of its instruments. If it had been a bass player or a drummer, it would have been a very different kind of music. Matthew Shipp: Well, it would have been more jazz. John Butcher: Yeah. So, it took it somewhere where there isn’t really a sonic history for that combination. Matthew Shipp: No there’s not, at all. John Butcher: And Thomas, having come to the synth through piano — I thought that would be interesting. Because he’s not a jazz player, he’s a classical player, he understands the touch. Trevor suggested, I think, a drummer or something and then I thought — ‘Oh, let’s try a different instrument’. Matthew Shipp: So he knew my work before that? Matthew Shipp: Oh he didn’t? (laughs) That’s great, because I feel very comfortable with him. I mean, electronics could be very intrusive if it was the wrong person, but he seems to really understand a lot about the piano, both the touch and the whole sensibility of the instrument, and he also knows a lot about rhythm. John Butcher: That’s it. I mean, a lot of it is rhythmic playing he does. Matthew Shipp: Yeah, so, he really understands rhythm — and that — makes all the difference in the world. Because there’s nothing worse in a situation like that where somebody has the potential to cover that much sonic space and they don’t understand that. John Butcher: Particularly in London, it doesn’t make much sense anymore to talk about an improvised scene because you go out to something which, on the surface, is called improvised but, it may be three people playing minimalist drones all night, which comes from a very different area of experimental music, and they’re drawing on whatever — Tony Conrad, La Monte Young and things. Which is ok, but I quite like it when things aren’t so clear... You haven’t all decided: ‘This is exactly what we’re going to do for the piece’. Then, it’s a composition. Bogdan Scoromide: Would you say their affinity to noise and improv is the result of a cultural thing? John Butcher: There’s a nice scene in London of younger players who have never played anything approaching jazz in their lives and have no desire to. 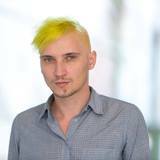 Bogdan Scoromide: Maybe they have already read that it’s a bit passé? John Butcher: Yeah, well there was that thing. I think that was certainly felt about fifteen years ago, but now nobody cares because they’re such separate scenes, you know? There’s still a lot of very minimal improvising happening. I used to work in it myself which I found kind of interesting, because when you’re working with big physical instruments like saxophones, it’s both an aesthetic and a technical challenge to try and work with in very minimalist improvising settings, which I found quite rewarding for a while but then, it becomes stale quite quickly as well. Matthew Shipp: You definitely have that language. Ioana Răileanu: You were talking about elasticity: How does that translate to music? Matthew Shipp: What I mean is a pulse moving through space, and depending on your flexibility with the rhythm, you’re like a rubber band; you just stretch, but it always snaps back to its center — somehow. Then also, when you build lines relating to that pulse in a group… I’m always, when I’m playing, trying to feel what people are basing what they’re playing off of — there’s some internal pulse in this music that they’re playing off of. Once I figure that out what they’re doing, I don’t want to parrot them and copy them. Even tonight, there’s times when I comp behind them, I don’t want to get in their way or force them in a bag either, but what I mean by elasticity is that time is kind of relative but there’s something moving through space that everything is related to. It’s the invisible glue that holds it all together somehow. Victor Stutz: Elasticity implies memory. Matthew Shipp: Yes it does, actually. I’d never thought of it in that way. John Butcher: That’s one of the things which is special about the live experience, because your hope is that at a live gig, people are going to listen from the beginning to the end, so the music makes its sense by hearing the entire shape of it. A lot of people don’t experience music like that anymore... I think it’s very hard to just walk into five minutes of this music and leave after five minutes and have a sense of it. But your rhythmic thinking is interesting, because I think my primary concern is colour. Placement is of course a rhythmic thing. As much as, if you like, a note sequence — I’m thinking of a colour sequence, through the pitches and things, approaching the different colours. 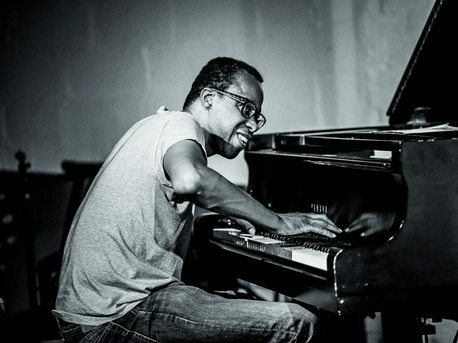 Matthew Shipp: I don’t know if I have a primary concern… I have a bunch of concerns (laughs). Yeah, I would say colour for me is a big thing, but for the piano I think of harmony in terms of colour. John Butcher: I think it’s because you have that possibility. The frustrating thing about the saxophone is that it’s either on or off. It doesn’t really have a decay, you know, and the whole interaction of the piano strings with each other which produces the whole sonic experience — the sympathetic vibrations — within the instrument; allowing notes to decay and overlap each other and occur simultaneously, you’ve got that whole world of colour change. And I guess with the saxophone I’ve tried to get in there by different techniques, to keep different sounds going at the same time, and shifting one and not the other. Rather than just having this machine that turns notes on and off. Matthew Shipp: Right, but the notes have colours and… yeah. I know I’ve experienced this thing to a Sonny Rollins solo, and just seeing all these bursts of colour. John Butcher: Yeah, but you listen to classical saxophone and it’s deathly. Matthew Shipp: (laughs) I’m not gonna go there. John Butcher: But Rollins is a great example of a colour player; you know, the colour in each tone is so different, so rich. Matthew Shipp: But are there any sax players you really like listening to solo sax from? John Butcher: Solo? I’m quite old fashioned in my saxophone tastes. 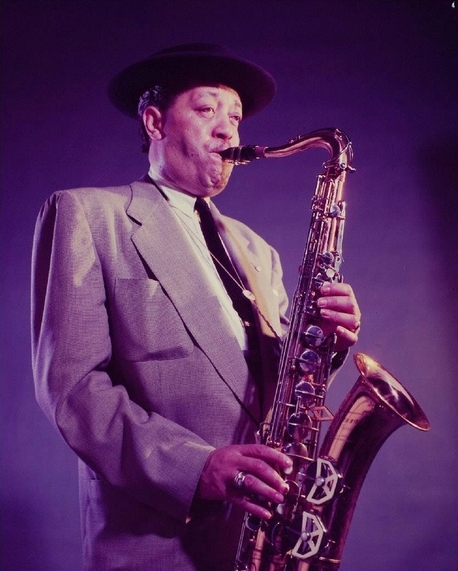 I think my favourite is Lester Young, actually. Matthew Shipp: He’s one of the most natural improvisers I’ve ever heard in my life. Where does that come from? John Butcher: I don’t know. The way he… he can take the most obvious notes of a melody and make them just sound so extraordinary. Matthew Shipp: It’s funny because you always think of Charlie Parker as… but there’s something about Lester Young that I’ve never heard in music before, and I can’t even put my hand on what it is it’s just… he’s just so natural sounding. John Butcher: He said he always learned the words of the songs, as well (laughter), that he was playing. Riccarda Kato: Do it like Han [Bennink], just don’t take the drums with you. John Butcher: Or do it like Elvin Jones and get your wife to pack up. Matthew Shipp: That brings up an interesting point. I know you know a lot about Coltrane’s language because I’ve heard you warming up to his stuff and doing things. Evan knows a lot about that. First of all, I would assume any modern improvising tenor player would basically want to stay away from that within playing at gigs but it’s just such a pervasive… oh, first of all, that language, to some extent, parts of it, has been so academic. Then second, nobody wants to be like Pharoah Sanders, that’s great for what it was, he played with Coltrane, but so, where do you see Coltrane’s language in the modern world, as we talk now in 2016? John Butcher: Well, when I was younger, the trouble was you heard so many copyists that it diluted the original for me. So after an initial fascination and love of his music, I couldn’t listen to it for about fifteen years because there’s been so many copyists. I remember doing a gig in Poland maybe ten years ago, someone played a record, it might have even been “A Love Supreme”. I listened to it and thought: ‘Wow, this is really great’, and I sort of came back to it but I needed those fifteen years away. John Butcher: Because what people did was that they learn to play somebody else kind of better, but I don’t really mean better, but it takes away all the interest. You know, they play the bottom notes better than he ever did when he really gets going. They could be really rough and awkward, they sound like they’re hard notes to get, but the copyists have smoothed it all out. You get that with some improvisers now, coming out of college who’ve studied Paul Rutherford records and play Paul Rutherford better than Paul Rutherford did. It’s really boring. 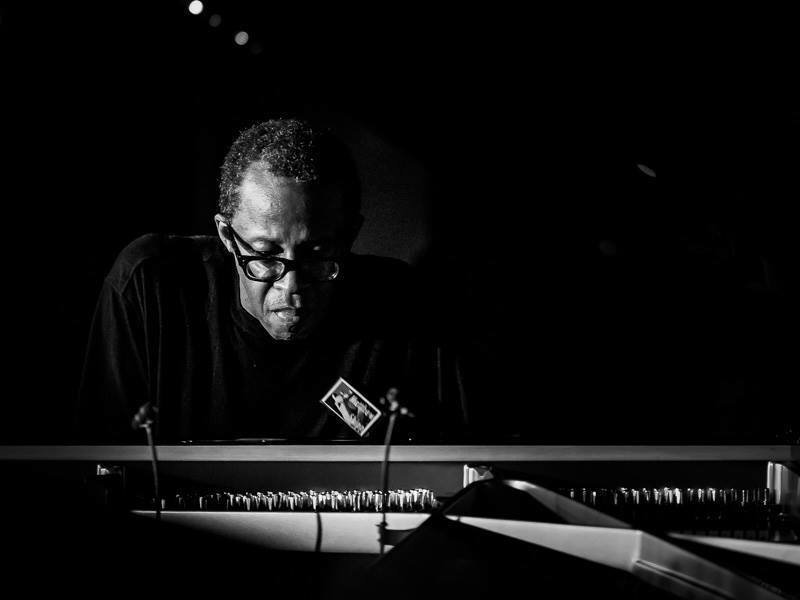 Matthew Shipp: Have you ever heard Andrew White? Riccarda Kato: Yes. It came to me now, while you were talking about Coltrane. Riccarda Kato: Well, I got his book “Trane'N Me” and was thinking: ‘Where is this guy?’ I’ve never heard of anyone talking about him. He's in Washington D.C., isn't he? 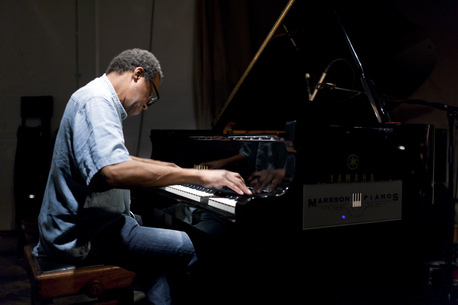 Matthew Shipp: Yeah, he’s crazy and he’s in Washington. But actually I’ve heard him play in the Julius Hemphill sax opera, and there was a Coltrane section, and it sounds kind of like organic like fresh language, I mean it doesn’t… but I’ve heard hundreds of Coltrane copyists in my life and you know, whatever. It goes from like a certain maybe sax players that played with Mccoy Tyner, and you know, it sort of works in that setting. But when I heard Andrew White, it sounded like fresh language. He knows that world so well and it just didn’t sound like somebody that goes to Berklee School of Music and studies it. John Butcher: He’s not a young man now? John Butcher: So he was actually really connected with the music that was happening because that makes a big difference. And that is the problem, what music can we really connect to? It’s not like we come from a specific musical culture anymore, it’s just everywhere. Matthew Shipp: I grew up in a Jackson Five culture (laughs). Bogdan Scoromide: But it seems to me that it’s like there’s something missing when someone arrives at or discovers improv through like, a cultural thing, reading that it’s pretty cool and it’s contemporary, this is it right now. If he or she discovers it through a cultural thing, it’s like those people doing the minimal thing that we were talking about. How do you see the way people approach improv? Victor Stutz: Can that idea go wrong? Just saying: ‘We’re going to do it our way’? John Butcher: We never really were that direct about it, saying to each other we’ll try to do it our way, we just sort of knew we were trying to do that rather than really talking about it. There’s a sixty year history of all kinds of experimental music now, and the danger is that people just rediscover for themselves stuff that’s been around for a long time anyway and it may suddenly be exciting for them to do it, but in the broader world, it’s not going anywhere. Victor Stutz: So you have to go somewhere? John Butcher: Well… there’s not one rule of course, you know, there’s a hundred ways of doing it. Riccarda Kato: That’s the whole beauty about it, a huge alternative attached to it. Riccarda Kato: When I used to live in Bucharest I was reading more about improvised music than I was hearing it because it wasn’t there, unfortunately. John Butcher: And also, it’s probably similar to you, a lot of early improvising I heard, I heard at gigs, I didn’t get records or anything, it was happening in London so I’d go out to gigs and hear the musicians there. Matthew Shipp: Well, you lived in a big metropolitan area. I grew up in Wilmington Delaware, which Philadelphia’s twenty minutes away from, so there was a big city, but I actually grew up a record collector, and I used to hear Sun Ra, because he lived in Germantown Pennsylvania which was very close to my house. So I used to hear the orchestra a lot, but the concerts I heard as a kid were regular jazz concerts. I heard Cecil Taylor for the first time when he played with Max Roach. I came up to New York, and I would have been like, eighteen or nineteen at that point. John Butcher: But what I mean is you could go out and hear, as an American, you could hear a lot of jazz, which was still happening in its natural environment, so there was still a scene that was happening. Matthew Shipp: Well, there was a really good club in my hometown and I saw everybody there. I saw Yusef Lateef there, McCoy Tyner - the jazz experience and the jazz life just made sense to me. When I hear an album, I can almost see the whole thing even just how the musician walks when he’s going to his instrument, you know? It all seems to be, the whole lifestyle and the whole thing seems to be one big language to me. And I kind of understand the thoughts that they might have when they get up in the morning. I just kind of intuitively got the whole thing intuitively very early on as far as really having some sensibility of what it means to think in terms of jazz. Now, I say that a little differently than talking about improvisation because it kinda is a stylized way of being a jazz musician and, I think in my case, the love of that and the understanding of that worked parallel to wanting to be a like a ‘cosmic musician’. Very early on both Coltrane and Sun Ra made a big impression on me; not ever wanting to copy them, but the idea that one could use music to try to understand the cosmos, or some type of music as some type of meditation to unleash cosmic forces, or to understand cosmic energy. That’s what I got out of both Coltrane and Sun Ra. Obviously they’re both completely different artists that did things in a certain way, but what I’m saying is… I defined myself as a jazz musician at one time, and then there’s this impulse in me to quote ‘be a cosmic musician’ because my idol, John Coltrane and my other idol Sun Ra are cosmic musicians. Now, how do you define that? How do you go to Berklee School of Music and say: ‘I want to be a cosmic musician’? I mean… there’s no such thing within jazz pedagogy. Riccarda Kato: Like... your own individual spirituality? John Butcher: Arthur Sullivan, of Gilbert and Sullivan, in the nineteenth century wrote a religious song called ‘In Search of the Lost Chord’, so maybe it was related to that. John Butcher: There has to really be a need for the music you play, and it has to be your own need. You have to get up in the morning and need to do it. Like a physical need, like a natural part of human desire, you know? It’s one of your desires that you feel you can satisfy. That need is maintained because if it works it takes you somewhere... I don’t know if it connects you to the cosmos, because to me it seems to take me somewhere away from everything rather than towards everything. It’s a time when I suddenly feel I’m free-floating, and you feel like you’re really in the moment, and everything’s in that moment. There’s a few other experiences in life that are like that, but I won’t go into them… (laughter) there are certain things that do that, and music, when it’s working, does that, as a player and sometimes as a listener. Matthew Shipp: What about one of your most intense experiences at a concert? I’ll tell you mine. I saw Yusef Lateef when I was a teenager and I was not stoned, this is not a product of that but… he played a bass clarinet solo that somehow physically… I was so into it, it hit me emotionally. I was sitting in the audience and I had almost a seizure and I just couldn’t help it, I just started going [makes violent abrupt noises] (laughter) and I might have like pissed myself and I just lost control. I don’t want to go to concerts and be peeing myself, but there was something really great about the music affecting you so much that I lost control of my body. That doesn’t happen often. In fact, that’s the only time it happened to that degree. Matthew Shipp: Yeah, Yusef Lateef did it for me. John Butcher: You know all those early Beatles shows with the teenage girls? It was awash with urine…when they were screaming. Apparently that was all you could smell at those concerts. (laughter) When you really get into a certain person’s music, I find I want to find out about that person. John Butcher: (laughs) I usually do, you know? Try to learn what their motivations are, something about their lives. Bogdan Scoromide: Does the cover of the LP help you? John Butcher: Not usually. Not these days. (laughs) I don’t read much commentary about music, but I like reading musicians who’ve written their own stories about their lives. John Butcher: Yeah. I’ve had times of being interested in the kind of music that takes you away from yourself, out and away from physicality and personality. I suppose John Cage articulated it the most, about trying to remove personal intention and I was seduced by these arguments for a while, and then I reacted against them. Some of his thoughts are quite persuasive, and you never unlearn the things you’ve learned from him, but you’ve to move somewhere else to do anything I think. Victor Stutz: I did that also, started to study anthropology — that’s why. “Where does that come from?” Comes from people and their whole environment. John Butcher: And music that comes from pre-modern cultures as well, and the meaning of music in those kinds of societies is really interesting. Or societies that don’t even think the sound rituals they’re doing are music; it’s part of a ritualistic expression. Bogdan Scoromide: Ralf Wehowsky said he doesn’t trust Cage when he speaks of indeterminacy; he deliberately chooses which elements to use and how to organize them..
John Butcher: Yeah, there’s still some very conventional things about Cage as a composer. Matthew Shipp: Especially his prepared piano pieces which are great. John Butcher: But also his relationship to performers and his point in the hierarchy of composer-musician-audience relationship is very traditional like that. Riccarda Kato: He only wanted his chair to be comfortable enough. (laughs) But I liked La Monte Young and the whole relation to the audience, he had so many thoughts about it, like how we could include the audience into the performance and make them be part of it. I first stumbled upon Terry Riley’s earlier works and now when I’m listening to what he’s been doing this past decade, I feel that he’s really repeating what he did earlier in his career. John Butcher: Yeah. It’s a danger of being an artist, a musician who is viewed as doing art, you’ve copyrighted yourself, 'This is what I do' and you’re stuck with it. Matthew Shipp: I think Monk made it work, for bizarre reasons, Monk became a sort of caricature of himself, but there’s still something cool about it, I mean he played the same tunes... In one sense he had no commercial success for most of his life, and in the last couple of decades he did, so he was being this character that was kind of new for the jazz world, but it kind of worked, maybe because what he did was so radical on the instrument. John Butcher: His pieces were so much his own. Matthew Shipp: Right. You could almost put him in a Monk museum, it was something really cool about it, but he was doing the same stuff that he had been doing 30 years earlier. Riccarda Kato: Was that because of financial reasons or just the thing he really wanted to do? Matthew Shipp: In my view of Monk, he just did what was before him, developing his music with a complete faith in himself, he kept doing it every day, he had a network of women around that protected him - his mother, his wife and the baroness — so even though he was crazy, he had an image in his mind of who he was, how he wanted to present his music. Even his name Thelonious Sphere Monk sounds like his music, he had a consistent way of dressing, all the pieces of the puzzle were there. On one level he’s just this crazy guy on the piano and on the other there’s an amazing amount of intent behind how everything was done. To me, the most important thing I get out of him is faith in his language. When he hits a chord on the piano, that’s what the world is at that second, period. There’s not one degree of apology or wavering... this is his vision of the world as it’s presented on the piano or within a composition. Matthew Shipp: It's a kind of holistic approach to the whole thing. Riccarda Kato: Would you compare Miles to Monk from this perspective? Matthew Shipp: Let's just say Miles was a clever guy, whereas Monk was 100% focused on the Monkian Universe. Miles obviously was an icon and a great figure in the music and that is great and beautiful, but as far as walking around with a language system in the way that Monk did, no. Sound adventurer and music selector based in Bucharest, with a background in Anthropology.